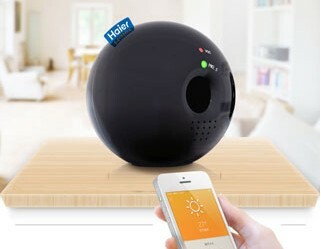 Haier Air Box is an indoor air quality detector that can connect air conditioners and purifiers of Haier or any other brands. An accompanying mobile app is able to command those home appliances to do the cleaning when air quality is poor. On the app users also can read data about indoor environment, air quality, temperature and humidity. Haier, the Chinese multinational consumer electronics and home appliances company, launched this gadget at this year’s CES and will begin selling it later this week on Jiae, a Chinese online retailer of creative electronics and accessories. TechNode got a chance to check it out. The gadget looks like average consumer electronics made by Chinese manufacturers. Haier developers are still tweaking the mobile app which doesn’t work smoothly. Although the hardware hasn’t been fine tuned and the software still in development, Haier is among the Chinese home appliance makers that have been determined to embrace the Smart Home trend. Earlier it launched U-home initiative that has produced seven home appliances that can be connected to home WiFi network and controlled by mobile apps. Another major Chinese home appliance brand Midea has launched a smart air-conditioner, by partnering with China’s e-commerce giant Alibaba. Midea wants to leverage Alibaba’s Cloud platform Aliyun and mobile apps. The air-conditioner and future smart appliances by Midea will be controlled through Alibaba’s mobile apps, payment app Alipay Wallet and mobile messaging app Laiwang, according to Alibaba. Midea announced an M-smart strategy claiming they’ll build a unified communication protocol and open it to everyone. Smart Home communication protocol is one thing and data generated by the connected appliances and users is another. That’s why Midea needs Aliyun to store the data and counts on Alibaba for data analysis. But to people in the Internet industry, neither Haier or Midea is moving fast enough. Xiaomi, the smartphone maker and mobile service provider, is adding Smart Home solution Broadlink into its smart WiFi router that users will be able to control all kinds of home appliances with a mobile app — they don’t need to buy a Midea smart air-conditioner or a Haier Air Box. Some early movers like Broadlink have come up with solutions for traditional appliance makers to embed into their future smart products — just like MTK solutions for smartphones. Before long those traditional makers will be in need of mobile software developers as new applications will bring home appliances to a whole new world. There are mixed feelings: the Smart Home market in China is still at an early stage but all of a sudden home appliances will become Smart through the Internet, at least being able to communicate with mobile apps.